Hustler's Super 104™ can easily handle acres of work. Offering a 104" width of cut, zero-turn precision and up to an impressive 11 mph speed, this machine is in a class by itself. 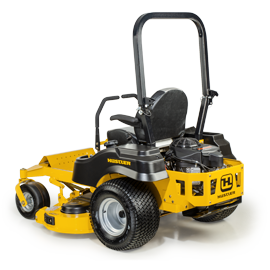 The widest and most productive of any commercial zero-turn mower. Features industrial-grade pumps and motors to handle tough jobs and long days in stride. A wide-area mower with zero-turn maneuverability gets you in and out of areas other wide area mowers can't. 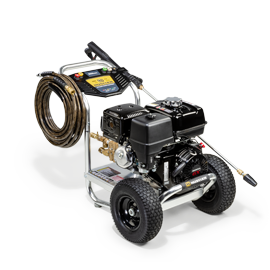 The Super 104 has the best warranty in its class in the industry. Seven heavy-duty replacement anti-scalp rollers with ball bearings for use when frequent ground contact is necessary. Super 104 is rated 3.4 out of 5 by 5. Rated 1 out of 5 by Baker from Not as advertised I purchased the Super 104 a little over a year ago. Now the dealer is a great guy but I cannot say the same about the Super 104. Since I purchased this machine it has been in the shop five times. Once for a broken hydraulic rear spindle. The rest because it will not start. Same issue over and over and over and over again. It is a true lemon.No one from Hustler will return any calls. That will tell you all you need to know about a company that will not stand behind its product. Rated 5 out of 5 by JohnBoy from Slower but faster I am the head mechanic/equipment manager at a municipality with 36 holes of golf. I ordered a 60”, 2-72”, and the 104”. The 104 is slower then the 72’s but cuts more acreage than one 72 can going faster. The next big plus to me is im on my 2nd and 3rd set of blades on the 72’s but still on the original first set on the 104, this is due to the rear discharge and not so much recutting/mulching action the 72 does, if your mowing a yard your not gonna get the 104 anyway but if your doing a school, hospital, large acreage every week, or things in that nature this machine is well worth it. Pricey but holding up good with one failure, the clutch went about 150 hours into it and my dealer overnighted one direct to me and picked up the old one when they had time “mowing season in fl”, just needed it going. All 4 mowers have been good though. Rated 3 out of 5 by TLM1 from Not so good so far The mower mows great when it is not in the shop, it has been in the shop four times so far for different issues. Which cause down time for my mowing business. Hopefully it is fixed now and will not need to go back to the shop. Rated 4 out of 5 by SHS Idaho from Fast !!!! We use our Z 104 on a 55 acre campus. Just by having this mower we have shaved a whole day off of mowing. It is a gas guzzler though. A gallon an hour it ! I really wish it had a diesel engine. Its a smooth ride and the frame is holding up. just wish it didn't collect the grass in the skid plates like it does. I really like this mower and it works well for me I just think with a few improvements it could be outstanding. Is there a gator blade option for the super 104? Yes, you can find the five blades at your local dealer. The cut height range on the Super 104 is 1&frac12; to 5&frac12;&rdquo;. With the rigid wings has anyone experienced scalping while mowing over uneven terrain? The video shows them mowing a football field - ideal conditions. How about the un ideal?